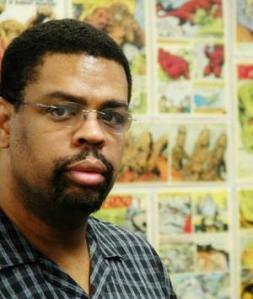 Dwayne McDuffie passed away on February 22, 2011 due to complications during surgery. The magnitude of this great tragedy cannot be overstated. Few African Americans get the opportunity to have the kind of influence that Mr. McDuffie did on the comicbook industry. He wrote for Marvel, DC Comics, Archie and Harvey comics. Working in television he wrote for a variety of animated series including Justice League, Justice League Unlimited, Ben 10, What’s New Scooby Doo, Teen Titans and Static Shock. He worked as an editor at Marvel Comics and was the co-creator and editor-in-chief of Milestone Comics which introduced a line of titles featuring African American Characters. He wrote the animated films All Star Superman and Justice League Crisis on Two Earths. He was a visionary creative talent who loved comics and comicbook characters. If you watched his cartoons or read his comicbook stories you were guaranteed to enjoy an authenic superhero experience. This amazing creator’s death leaves a huge void that is likely never to be completely filled. But the legacy he leaves behind gives him a measure of immortality. I encourage you to seek his work. Read his stories. Watch his cartoons. If you’re unfamiliar with Dwayne McDuffie you’re in for a rare treat. This was a guy who understood what superhero stories are supposed to be about and he always brought his “A” game. He’ll be sorely missed. ← "We Are Watching You…!"